Looking for a homemade Valentine’s Day gift idea for someone who loves to cook? Or maybe you love to cook and someone special is always raving about the food you make? 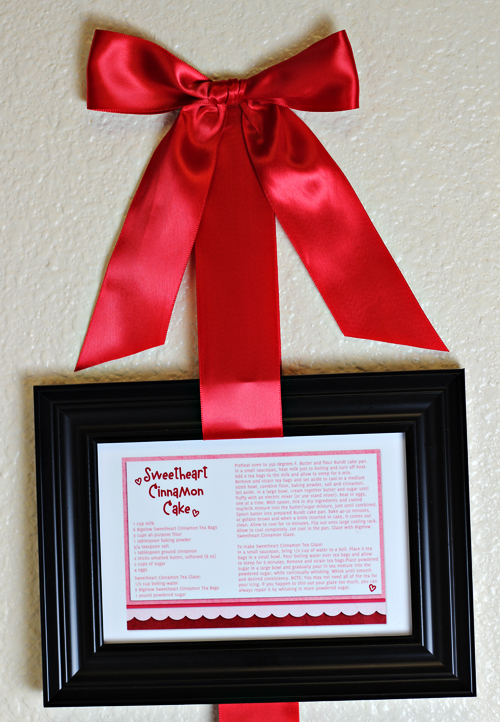 Making framed recipe cards, hanging from ribbon, is an easy gift that’s perfect for Valentine’s Day or any special occasion — you might even want to make one for yourself. I love to share modern-day recipe keeping ideas with all of you, and today, I’m sharing another idea. If you have someone who makes amazing food, turn their recipes into recipe cards and then turn those cards into art for your kitchen or dining room. It’s a lovely gift idea for Valentine’s Day for your mom, grandmother…or anyone else you love. To create my recipe cards, I first created them in Photoshop (sized at 4×6″). I have directions for how to make recipe cards in Photoshop or Photoshop Elements. If you don’t have Photoshop or Photoshop Elements, you can also create your recipe cards in other ways. 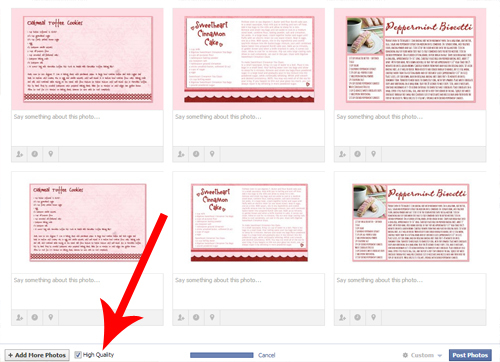 I also have directions on how to make recipe cards in PicMonkey (a free online image editor). 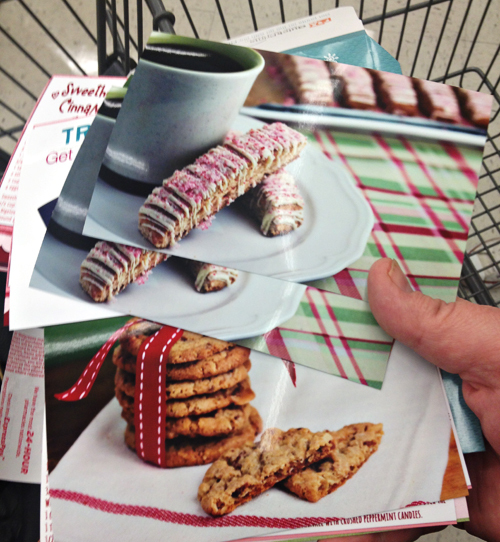 If you wish, you can also scan original, handwritten recipe cards into your computer. 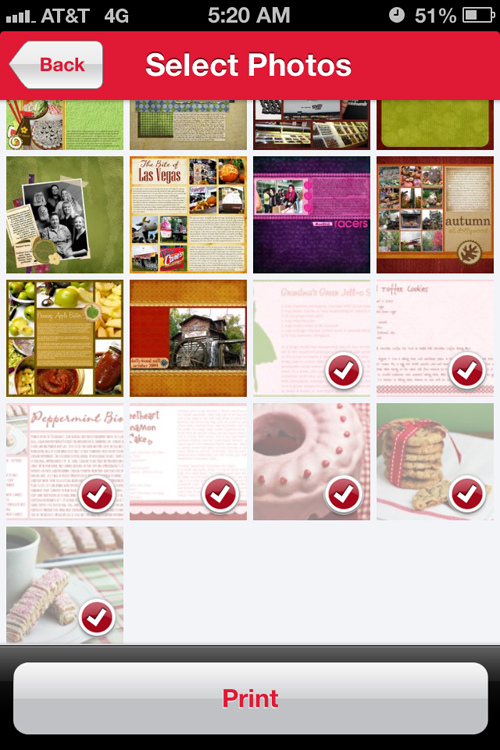 I recently learned about using the Walgreens app to order prints, so for my recipe cards, this is exactly what I did. 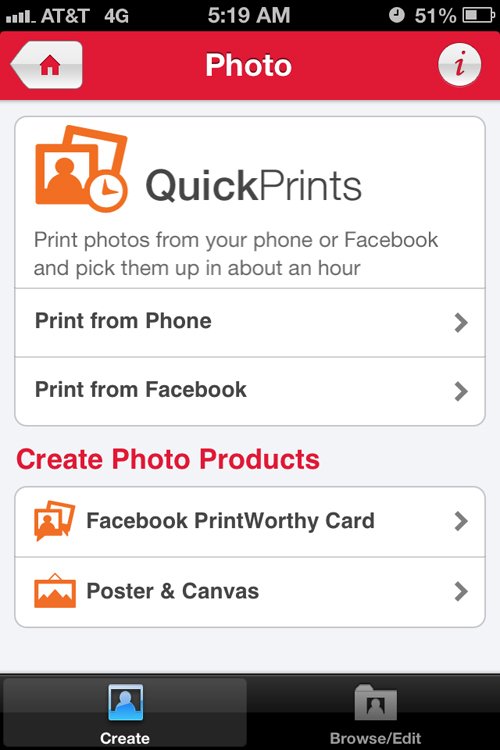 You can upload photos (or in our case, recipe cards) that are either on your iPad, iPhone or Android phone OR you can order prints from photos uploaded to Facebook. I upload a lot of my recipe cards and scrapbook layouts to Facebook anyway, so this was the perfect route for me. I saved my recipe cards at a high resolution (300dpi) and then uploaded them to my personal Facebook account into an album that I already use for this things like recipe cards and scrapbooking layouts. NOTE: When you do this, the important part is to make sure you have “high quality” checked when uploading to Facebook. This will give you the best quality photo (recipe card). Then I opened the Walgreen app on my iPhone and went into the Photo section and selected “Print from Facebook”. You’ll see there is even more options in there too, including a really cool one where you can Facebook PrintWorthy Cards. But for this, I just did the “Print from Facebook” option. TIP: While you are using the app, there is all sorts of helpful sections, such as a pill reminder, weekly ads and you can refill prescriptions. One of the other areas I used on the app was that I signed up for Walgreens Balance Reward card, which I can use at Walgreen just by entering my phone number or showing my phone. The reward card allows you to earn points, which earn you cash back. The app then allowed me to tap and select the photos (recipe cards) that I wanted to order prints of. It was SO easy. You can see LOTS of photos from my experience HERE. I printed extras of each copy in case I needed them for another project or if I messed up at all during this one — and at only .29 cents per print, I figured I better be safe than sorry. I ordered my prints very early in the morning (5:30am), before the store was even open, but was so happy to see that my prints would be ready for me right after the store opened. Right on time, I got an email telling me that my photos were ready for pick-up. It was so fast and easy! I don’t know about you, but I’m attach to my phone constantly, so being able to do this from my phone is so convenient. I headed up to Walgreen that day and picked up my prints. 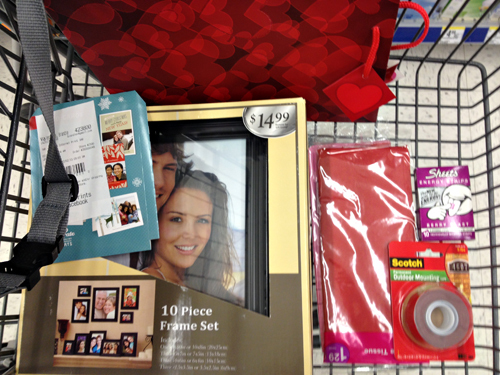 After I grabbed my prints, I picked up a few other things for my Valentine’s Day Photo Gift — photo frames (you’ll need three 4×6″ frames for this gift idea), Valentine gift bags, tissue paper and mounting tape. Once I was back at home, I got busy on my Framed Recipe Cards. 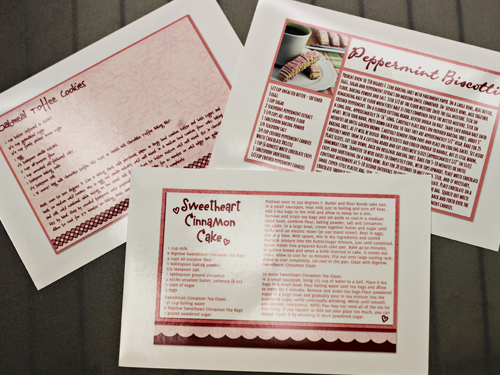 Here’s my recipe cards that were printed at Walgreens, that I will be using in this project. 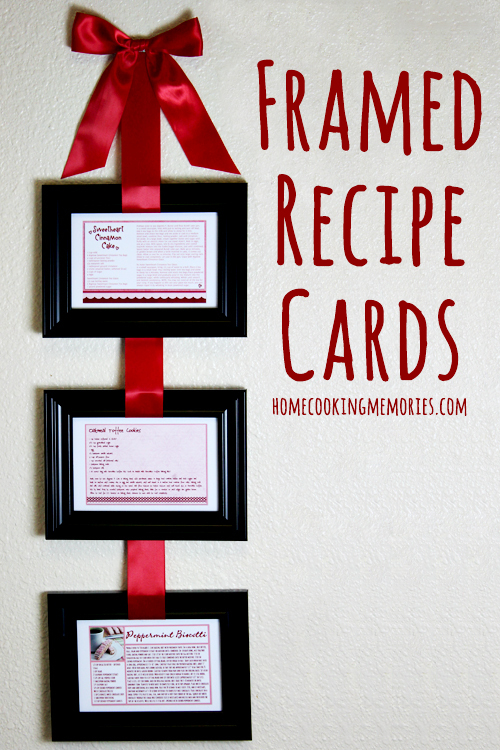 Each recipe card is slipped into one of the 4×6″ frames. 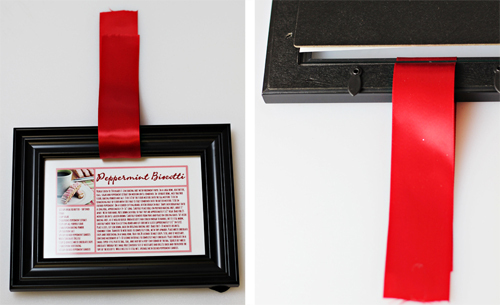 A 12″ piece of red ribbon is threaded over and under the top of the frame, so it’s looping the top of the frame. You will have to pop the glass up a bit to do this, so please use caution. You’ll repeat this step with each of the frames. The frame are laid out, back-side up, and a small square of permanent mounting tape (I used Scotch Permanent Outdoor Mounting Tape, holds up to 5 lbs), in the very middle near the bottom edge of the top and middle frame (you’ll see it in the photo below where the red square is). Working with the middle and bottom frame first, space them 2″ apart when measuring from the top edge of the bottom frame and the bottom edge of the middle frame. 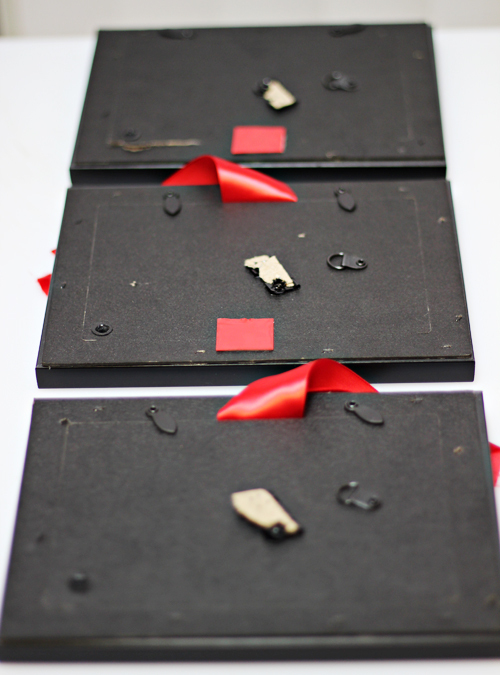 Press the bottom tail of the ribbon from the bottom frame onto the mounting tape that is on the middle frame. Cut another piece of mounting tape and place it directly on top of the ribbon you just pressed down, directly on top of the area where the other piece of mountain tape was at. 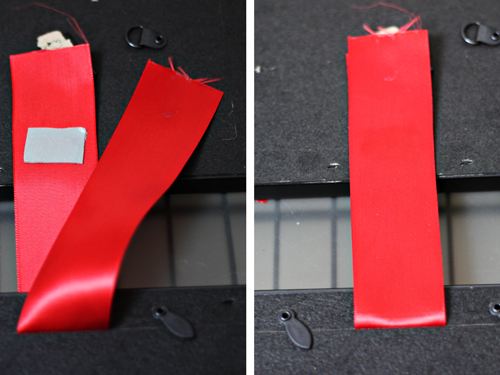 Press the top tail of the ribbon from the bottom frame onto the mounting tape. Press firmly to ensure that it is secure. Repeat these steps with the top frame and the middle frame. Turn over your frames. 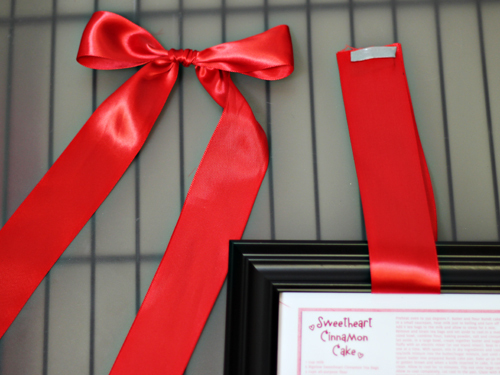 For the top, cut a piece of mounting tape and secure the two tails of the ribbon on the top together. Create a bow with remaining ribbon. Then, cut another skinny rectangle of the mounting tape and place it on the top of the two secured ribbon tails. Press the bow directly onto the top of the mounting tape. Trim the tails of the bow as necessary. To hang, I used a small nail and nailed under the bow as much as possible, directly into the ribbon loop that is attached to the top frame. Of course, this project will also work without recipe cards — simply follow all the instructions above but fill the frames with photos of a vacation or of your loved ones. No doubt it will be a treasured Valentine’s Day gift! And if you are interested in more photo gift ideas, right now Walgreens is running a 14 Gifts of Love for Valentine’s Day promotion, with daily deals, in their photo department. I’m so happy with how my Framed Recipe Cards turned out and I also love that I found a new way to have my recipe cards printed. I print a lot of recipe cards, but have frequently done it from home (using up my ink, plus I usually have to trim them since I print on larger paper). It’s nice to know that I can have them printed just up the road from my house at Walgreens…without all the hassle. Right now I’m thinking of more projects that I can create using the Walgreen app — I’ve been wanting to do something with all of my Instragram photos for a while now. I hope I’ve inspired you to create your own recipes cards and to create a Valentine’s Day Photo gift for someone special to you. If you make the project, or use the Walgreens app, I’d love to know! And if you’d like to connect with Walgreens, you can find them on both Twitter and Facebook. 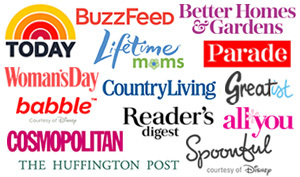 Disclosure: I am a member of the Collective Bias® Social Fabric® Community. This shop has been compensated as part of a social shopper insights study for Collective Bias® and Walgreens #HappyHealthy #cbias #SocialFabric. All opinions are 100% my own. Great idea! I have a friend that calls me a few times a year for the same recipe every time. She seems to always lose it. This is a perfect homemade gift idea for her. I’ll add a couple more recipe cards of dishes that I know she enjoys. There won’t be any more excuses for her not having my recipe! They look so nice framed and would make cute kitchen decorations!! That is such a great idea. I would love to do that with recipe cards that my Grandma wrote. Great idea! My mom has something similar with recipe cards that my grandma’s had both filled out. It’s nice to see their own recipes in their own handwriting now that they are gone. And great tip for making recipe cards. I love those! What a fabulous idea and great tips!! Thanks for sharing at the Monday Funday party! I would love to take some old family recipes and hang them like this. Thanks for the great idea! Pinning! I LOVE this idea! I would never have thought to print photos of recipes but that is a great idea – what a neat way to keep treasured family recipes in sight and show off some great food photography! What a unique idea, thanks for sharing! Awesome! I love it. Your photos are stunning and what a great way to preserve that favorite family recipe. Such a cute and well thought out idea Brandie! Well done! What a great idea and a wonderful way to preserve your favorite recipes! What a beautiful idea! Your recipe photos are amazing! What a great idea – I should do this with my Grandma’s Cookie Recipe!